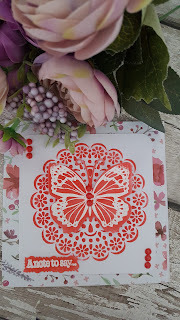 Hello everyone today I am sharing a card I made using a new stencil and one of my favourite Butterfly stamps. I used the colour Red as my focal image which is a colour that I very rarely use. I was happy with the end result. I am on a crafty mission to try to use the paper pads that I already have in my stash rather than buying more. I f you would like to watch my Youtube tutorial on how I made this card I will leave the link to my channel. Thankyou for taking a look at my post.